Is It Safe To Warm Up Your Car In The Winter? There is an old wives’ tale that you need to turn on your car in cold weather, and let it run for a while so it can warm up before you begin driving. 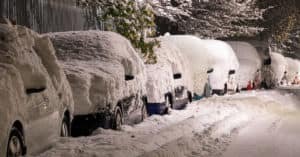 So, during the winter months, you’ll see people running out to their vehicles to turn on their engines before they leave for their destinations. However, this isn’t the case. Consider the following facts about warming up your car in the winter. The need to warm up your car before driving it stems from outdated information from back when cars had carburetors. In order to get the carburetor to run smoothly, they would leave it running for 20 to 30 minutes before they needed to drive. The idea was that letting the cars warm up gently would reduce the overall wear and tear on the vehicle. However, today’s vehicles have fuel-injected engines that don’t need to warm up. They are already capable of operating perfectly, even in freezing weather. A better way to “warm up” your car is to simply drive it, as this is the quickest way that you can warm up the engine components of your car. Unfortunately, you may end up doing damage to your car’s engine if you let it idle in the winter for no reason. Engine oil dilution can take place when raw gasoline seeps into your engine’s oil. This makes the oil less effective by breaking down the engine oil’s lubrication ability. This can increase the wear and tear on your car, which is what most people are trying to avoid by warming up their engines in the first place. While your vehicle doesn’t need to warm up its engine by idling to drive, it still makes sense to start your drive slowly to give your car’s mechanical components an opportunity to heat up to peak operational temperature. Even five to 10 minutes of slower driving is enough time to reduce strain on your car’s engine, so it can go back to a normal fuel-to-air ratio. In the winter, you’ll still need to take a few steps to prepare your car to drive through the snow. First, you can start your engine to warm up the inside of the car for your comfort and to help defrost your windows. Then, clear your windows of any ice or snow that has formed on your windshield, windows, or exterior mirrors. You want to make sure that you can see clearly, especially in the winter months when road conditions might be poor. This winter, stop wasting gas and time warming up your car. Unless you have a very old model that still uses a carburetor, it can do more damage to your car than benefit. Instead, make sure to prepare your car by clearing off your windows and dashboard to improve visibility. This will help to ensure that you stay safe all winter long. 0 comment(s) so far on Is It Safe To Warm Up Your Car In The Winter?